The new school year started today but my girls return to school tomorrow as today is staff development day. Books, bags, uniforms, shoes, lunch boxes and drink bottles have been labelled and ready for the new term. This year, I am trialling something new to get my girls to be more responsible and accountable for their snacks for morning tea and lunches. This means them eating their food and not bring them home at the end of the day. 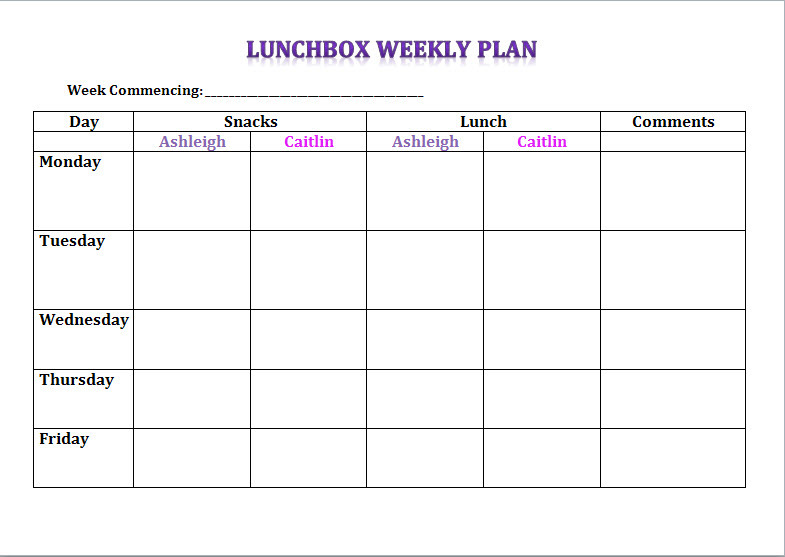 I have created a weekly lunch box plan. Each week, my two girls will complete the plan with what they want to eat. In the Comments column, they must make note of any excursions etc so that I will know how to pack. The older girl has a tuckshop at school, so she will need to let me know if she's buying lunch for the day. Hopefully this approach will help them to play an active part in their lunches. I will still have finally say when I review their plan e.g. must have a piece of fruit every day and not too much junk food. I have fussy eaters, one who likes sandwiches and the other doesn't. Makes my mornings difficult and hence, I have to be organised. A tip I learnt from other Mums is to have as much packed and ready the night before, that is, wash and fill drink bottles, pack snacks and fruits (if needed, cut them up and put them in the fridge). ﻿Let's see how we go with this plan in Term 1. What do you pack for your children's lunch boxes? Are they fussy eaters too or happy to eat what's packed? All my children have different tastes. One will eat sandwiches, and one says 'a sandwich isn't a meal!'. I will plan...but will neglect it after a few days. The spirit is willing but the flesh is weak. Hehehehehe!!!! You are so well organized. I don't plan. It's sort of fixed every week -- Monday & Tues are sandwiches, Wed - buy from school canteen, Thurs - buns or cakes or biscuits, Friday - either cake, bread or buy fr canteen. 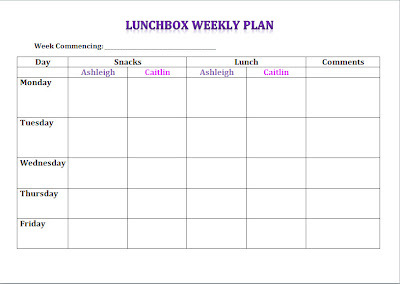 How's the lunch box plan coming along? I love holidays because it means not having to pack lunch :) Luckily my girls like fruit so that part is easy, but they don't like sandwiches so I'm always on the lookout for simple ideas to keep them going. I frequently use leftovers too - rice and cous-cous make easy (and filling) salad bases. Hope it's all going well and happy new year to you and your family.